Are you interested in applying for a Community Arts Grant? On Tuesday, March 25th, Lane Arts Council will host a Community Arts Grant informational workshop for the upcoming grant opportunity. This workshop will cover specifics about the grant and application process. The workshop will be presented by Liora Sponko, Executive Director of Lane Arts Council at the Midtown Arts Center, Conference Room, 2nd Floor, 1590 Willamette St from 4-6pm. The Community Arts Grant helps ensure diverse and accessible arts opportunities and experiences for Eugene artists, audiences and participants. 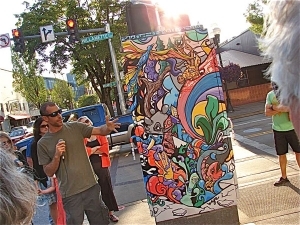 This grant is available to all creative and cultural arts media and disciplines for projects that make an impact on Eugene residents. The workshop is free. Please RSVP to Katy Vizdal at katy@lanearts.org or 541-485-2278 and visit our workshop page for more information.